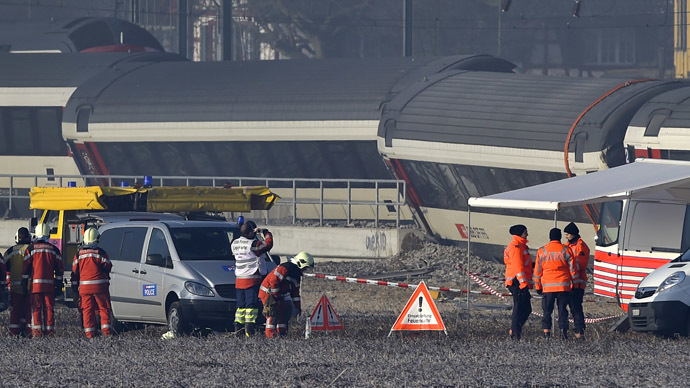 Two Swiss passenger trains have collided near Rafz Station north of Zurich in an accident early morning, injuring at least 5 people, one seriously, according to police. Previously a member of the emergency services was cited as saying the figure of injured stood at 49. A witness riding in one of the trains described how the S-Bahn Schaffhausen derailed in Rafz Station, saying that “probably the engineer has overlooked a red light.” But then, “from behind came the fast train from Zurich to Schaffhausen,” ramming the first train and shifting it sideways. A total of five cars were reportedly derailed. There was smoke in the front area of the S-bahn, witness January Sieber, 18, told local media. “The trains looked pretty badly damaged,” he said, while another witness reported how one of the trains stood still on the bridge. Both drivers then asked the passengers to disembark, as “ambulances from across the region were mobilized” to treat the injured, according to an employee speaking anonymously. Rafz Station was being secured and roads were blocked as numerous police and emergency vehicles arrived at the scene.